In Now You See Me 2, the Four Horsemen are back in this crazy mind-blowing, eye-deceiving flick of a sequel. First off we have the original cast back: J. Daniel Atlas (Jesse Eisenberg), Merritt Mckinney (Woody Harrelson), Jack Wilder (Dave Franco), and new horsemen Replacing Henley Reeves (Isla Fisher) by the name of Lula (Lizzy Caplan). Not only are they the magic enthusiasts they are now under their leader and if you haven't seen the last movie that had a twist, exit out of this page. Still reading this? It is now too late. FBI agent and part of the Organization "The Eye" from which the horsemen work under is Dylan Rhodes (Mark Ruffalo). Not only is he a good leader but you get to see how much he cares about his Horsemen even though his Horsemen don't believe in him at times. We also get to meet the new antagonist of the film and from being such a protagonist in Harry Potter, Daniel Radcliffe (as Walter Mabry) is a surprising villain. He is the son of Now You See Me's villain, Arthur Tressler (Michael Caine) and both are hard to handle. Good ol Morgan Freeman returns in this flick but with a bigger role. 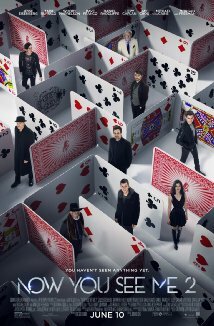 Now You See Me 2 still plays mind games the whole time and it was fun seeing how they did it. This time the Four Horsemen are rallied together by Walter and if they don't do this impossible heist and/or do what he says, then each one of them will be killed off. So, Atlas being the leader of the four when Dylan isn't around, takes the lead and agrees to whatever Walter asks. The film is a roller coaster of a good time and worth seeing on the big screen. Yes, there is a reveal in the end which is not as big as the last one but it's still pretty good. If you enjoyed Now You See Me, missing out on seeing Now You See Me 2 will be a mistake. The Four Horsemen are back.